Sometimes things come together in unexpected ways. They did so for me last Sunday when a Gospel story, prison, World Youth Day and a petition to the Australian Bishops fell into place. The story was from Matthew's Gospel where Jesus asked Peter what other people made of him, and then how Peter himself would describe him. When Peter answered that he was the Christ, the Son of God, Jesus replied that Peter would be the rock on which the church will be built. This text has come to underpin the Catholic understanding of the role of the Papacy. I preached on this text in a prison. In that context the two questions Jesus asked appeared courageous. At the best of times, to ask close friends what other people think of us, and even more what they themselves think of us, takes courage. Our self-doubt and uncertainty whether the regard we have for our friends is fully reciprocated mean we will hang on the answer with some trepidation. But if you are in jail you have only to read the tabloids and listen to shock-jocks to know what people think of you. You may be preoccupied with how you will be received when you leave prison. And your sense of shame and the disruption to your relationships with family and friends put enormous strain on your sense of self-worth. You would be very fearful of asking them what they think of you. So this story spoke powerfully to the prisoners. It invited them to ask what and who mattered to them. The context of the religious service provides a space for reflection, allowing some relief from the wheel of harsh judgment, made by themselves and others, on which they are broken. Here it is possible to entertain the idea that they are precious to a God who loves each person passionately. Still musing on the morning spent in the prison, I later caught a few minutes of the World Youth Day Mass telecast from Madrid. The aging Pope Benedict was reading a scholarly sermon on the same Gospel story. Hundreds of Bishops in white their mitres and thousands of priests in their white sun hats sat close by. Young people stretched back, some tired, some listening intently. When Benedict referred to himself as the successor of Peter it was possible to see the historical and personal weight of the office and the way it might shape his sense of what matters and of who he is. From the perspective of the story of Jesus and Peter, World Youth Day is an occasion of reassurance. Bishops and priests are confronted daily with evidence that many people do not have a high opinion of the Catholic Church or of its ministers. 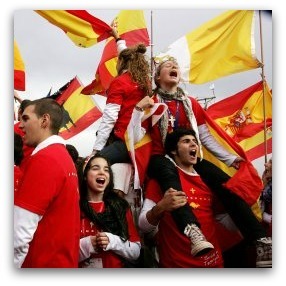 At World Youth day they meet young people who welcome them warmly and are enthusiastic in their own faith. These young people, who may be isolated among their peers by their religious commitment, also find reassurance that they are in good and plentiful company. World Youth Day offers a controlled environment where people can reassure one another that they and their faith do matter. That surely is a significant reason why such large resources are put into such large, passing events. When I turned at nigh to the Sunday newspapers, they carried news of a petition already signed by thousands of Australian Catholics. The moderately worded petition draws attention to the diminishment in the Australian Church, and the need for renewal in the governance of the universal Church. It asks the Bishops to bring these concerns to the Pope when they visit him later this year. The petition took me back to the way the story of Jesus and Peter was heard in the prison. It is daunting to ask others what they think of you. It is also challenging to listen to what they tell you. It is easier to seek reassurance in more flattering conversations. But the story suggests that faith grows when Peter is asked what he makes of Jesus, and is heard. The petition is a small, honest voice. How it is received and responded to will make its own statement. To know that you will be heard and taken seriously when you speak honestly is the best form of reassurance. This article reminds me of why I am so appreciative of Eureka Street. It is based in reality, it is thought-provoking, it challenges me in new and life-giving ways, it ia a sane voice in the midst of so much shock-jockery and fundamentalism in society and church, and so gives hope and invites new possibilities. Thank you. Well, each to their own views I suppose. If Benedict has no idea how the Vatican is viewed throughout the world then he is living in a cocoon. But to those who sign 'petitions', particularly 'reasonable' ones, I'd have to suggest 'they must be dreaming'. Why would a 'reasonable' petition be taken any notice of? The Catholic Church is not the least bit interested in hearing the voices of mere mortals, and why would it? It is always right, even when it's wrong. And Popes can never be wrong anyway. Next time Andrew is in a jail, he might like to ask the prisoners what they think of the community that consistently fails the jailed, and judges them long after they exit the system, if in fact they ever do. That failure by the community starts well before jail, and the Church plays its role in making sure these matters are not addressed. There is a 'mote and plank' story here. The petition is not worth a cracker. We need to pray that Benedict XVI is replaced with a true Catholic Pope and all the dissident and negative hierarchy and clergy be dismissed. The Church can never be a democracy and we do need true Catholic priests and bishops to lead us on our path to Salvation which under the present hierarchy is not being done or even talked about. Those who have position and power never even talk about our Salvation which they must answer to Our Lord for, and which should be of primary concern for all of us and our neighbours. We are called upon to convert all nations and people to the True Faith so as to save their souls to Heaven, not just stand by and murmur about the Church while so many souls are lost to Hell. Many so-called "Catholics" reject its immutable teachings, dogmas and doctrines. Parents who don't know the Faith because of the "New Theology" aren't able to teach their children, and so many people reject authority. They are too proud to humble themselves to accept the true teachings of the Church. "I've never truly understood why modern people who have choice and who hate the Church so much that they want to change her essences, go through so much trouble to fix her when the Church of their choice is just down the street. Perhaps it is because the laity have forgotten about is sin - why do we want a synod - to have priests who don't care about doctrine and will give us golden calves. Finally, families make priests. If Catholic parents truly honored the priesthood and the Church, we'd have priests." The petition is moderately worded, and invites further conversation at many levels. It is ironic that some priests and bishops have declared that it will not be made available to their parishioners. This only underscores one of the petition's requests - that the hierarchy needs to listen more to the voice of the people. The petition is important. Many people have had to think seriously on the matter before they signed. But the petition should only be the beginning. I await the response from the bishops and the Vatican and then we make our next move. Like Andrew, I too celebrated Mass in prison last Sunday, here in Canberra. The prison Mass was in the afternoon. In the morning I had celebrated Mass for the Carmelite Sisters and a sizeable congregation of lay people. I told them I would be saying Mass in the prison in the afternoon and invited them to be in solidarity with their brothers "inside". Like Andrew, I came away from the prison Mass uplifted by the openness and faith of my friends who were so appreciative of not being left "out of sight, out of mind". With all the turmoil in the Church today, I am turning more and more to God's "little ones" in trying to see an authentic response to the call of the Gospel. The petition is a valid form of expression for people who wish their voice to be heard and cannot do it individually. I personally didn't sign it - some of the issues and concerns expressed are much more nuanced than I think the petition allowed, and I didn't wish to put my name to it without being able to distinguish some points. I thought it might be more effective to write a letter. Harry, I understand your cynicism, but I truly live in hope for the Church. Over time, we have seen the Church evolve and discern matters according to discernment, new knowledge and the sensus fidelium (see below). Trent, I am astonished that you judge Pope Benedict as not a 'true Catholic Pope'. What actions should 'true' Catholics take to convert all nations and save their souls? Are 'true' Catholics doing this? On the matter of dissidents in the Church, I note that St Catherine of Siena (a Doctor of the Church), Oscar Romero (a martyr), Australia's St Mary MacKillop and many others were all considered 'dissident'. As I mentioned above to Harry, some of the Church's teachings have changed. The Catechism itself teaches that there is a role for sensus fidelium / sensus fidei in the faith of the Church. (see http://www.vatican.va/archive/ENG0015/__P2A.HTM). I understand the teaching of the Assumption of Mary arose from the sensus fidei. I find the quote from Mary a little closed - this is again a matter that is complex and nuanced. I note that apart from the last four centuries, the Roman rite allowed married priests. I am glad that some people still identify as Catholic even if they reject some of the teachings. I believe in an 'open door' so that people are invited into their faith into a more meaningful way, and then grow ever deeper in their faith. Nicely drawn together, Andrew. I'm one of the many who signed the petition. Whilst I love my Church, but I acknowledge its many faults and failures - it's the human element! The requests contained within the petition are worthy of honest and genuine consideration by Church leadership and no-one should be afraid of change. "I am turning more and more to God's "little ones" in trying to see an authentic response to the call of the Gospel." That's an interesting point, because perhaps one reason for the sad state of the Catholic Church is just because it is such a large and hierarchical organisation. As in almost any such organisations the people who rise to the higher positions often have egos to match - they have been and are some very clear examples! Such people will not accept any hint of criticism from below. Of course, more eloquent than a petition is the number of people who have simply left the Church (there must be more who have left it than in it) because in so many ways it doesn't represent Christ's message. Another good read! It is also interesting to read the various comments which range from the liberal view to the conservative/fundamentalist view. It proves that the Catholic Church is a very broad Church. We should respect all opinions and embrace all people in the Church especially those whom are marginalised such as women, prisoners, poor people, homosexuals etc. I thank both Fr. Andrew Hamilton and Bishop Pat Power for their masses in prison and their embracing of prisoners as fellow members of the Church community. A great act of Charity! With respect to the petition, we should never forget that people have a right to have a say in the running of the church. The people are the Church! The World Youth Day provides great hope that the future of the Church is in good hands. Again, the people are the Church! I have recently read the memoirs of the Swiss theologian Hans Kung and it should be a must read for all Catholics. Ah, in the long run the church is simply a means to an end. You might need it for a long time or for a shorter time but if you truly search you will find, maybe within or maybe without. Just allow people to walk their walk. We are all held in God's loving embrace. Andy has identified the major challenge for Catholics for Renewal and that is for the Australian bishops to realise that the petition is "a small, honest voice" and that "how it is received and responded to will make its own statement". The voice may be small proportionately, but the fact that many thousands of Catholics have chosen to put their names (and many insightful comments as well can be found online http://www.petitiononline.com/adlim11/petition.html)to this " moderately worded" but plain speaking Open Letter should provide comfort to the bishops in driving the much-needed renewal of the Church. A marvellous article by Andrew in a long line of great pieces he contributes to Eureka Street. I am also thoroughly in tune with all those who have added their comments, except Trent’s (pseudonym appropriate in the circumstances). But one discordant voice is not too bad and to be expected (and there were many such pre-and post-Council of Trent, some four hundred and fifty years ago!). Thanks for the bonus of Pat Power’s observations. As I've said before, the "moderately worded petition" is in fact code. For example, I, a Catholic who worships in the Extraordinary Form can entirely subscribe to its sentiment: "The Church no longer adequately inspires many of our communities. It has alienated too many adults who were born of Catholic parents, attended Catholic schools, and lived a sacramental life. It has become disconnected from, and irrelevant to the lives of too many of our children." But not for the reason the subscribers maintain. In fact, for entirely opposite reasons. Last time I was at Mass in a prison, it was Swaleside high security (category B) prison on the island of Sheppey in the Thames, in 2004. It was a Solemn High Mass, Extraordinary Form. Mass was delayed because one inmate took what seemed like eternity to confess his sins. Praise God! It only inspired us more. The MC was a 'lifer'. A very good MC, I might add. He and all the inmate servers had practiced for months in their two-hour recreation time to get the rubrics exactly right. They didn't quite, but, my word, they were just brilliant. I led a choir singing Gregorian chant. High above us in the tower balcony, guards patrolled with rifles. Needless to say, the accoustics were perfect for the chant. Afterward, we enjoyed a cup of tea and cake with the inmates. The one woman present was treated with the utmost courtesy. Lots of backslapping, hugs and laughter. I told the MC he should consider migrating to Australia once he was released as we had need for such excellent rubricians in the Extraordinary Form in Australia. He said there might be difficulties getting in with his record. I said it shouldn't be a problem, as having a criminal record was until recently a prerequisite for getting into Australia. Lame joke, yes, but laughter all around! I also chatted long with an inmate who had been baptised a month before. He and some others had tears in their eyes. So did I. Reasons why I'm glad I'm an atheist, number 1. Trent, you confirm me in my atheism. Or at least potential Anglicanism. My first attempt to post this seemed not to work. Perhaps it was misdirected to Trent's hell of lost souls, where they're having a good murmur, if not a giggle. This petition has been put together by people who genuinely care about the Church. That is why they have invested so much of their time. Rather than just walk away they have carefully and respectfully put their energies into promoting dialogue. Much consultation has taken place with a wide group of concerned Catholics who all are prepared to stand up for a Church that can proudly claim Jesus as their leader as well as follow his example of how to live as a priestly people. We desire a Church that will not just hand out charity but one that is prepared to speak out for justice and equality, for respect and dignity, for openness and understanding. The Church we long for is a community of faithful that does not distinguish between woman and man or between laity and clergy; where the focus is on the person rather than dogma. Where people are empowered to use their gifts to bring about a world where the kingdom of God is more of a reality than a fantasy. On the petition site - http://www.petitiononline.com/adlim11/petition.html - many comments can be observed from thousands of people who share this dream. How on earth Trent can you suggest that Benedict XVI is not a 'true Catholic Pope' when he was elected by the College of Cardinals acting under Divine guidance according to the proper process? I would sincerely like to hear your answers. I was taught in Catholic Schools in the 1940's. There is no doubt that the human face of the Church does not always bring the image of Christ. Is a petition to the Church a petition to Christ? Is it a power play among human beings? Christ works through human beings I know but I am always left with some disturbance of my spirit when there appears to be aggressive criticism of the Church. Many things are disturbing in the way the humans are "running" the Church but I don't know how aggressive our criticism of it should be. Fortunately it's not my job to tell the humans what Christ wants them to do. A petition is pointless because the Church is not a democracy. Just like other undemocratic regimes with mediaeval attitudes towards women and homosexuals, more drastic action is needed. Right thinking Catholics should refuse to go to church or send their children to Catholic schools until reform is reached. That will send the message that enough is enough and you also get to sleep in on Sunday mornings! Factors such as education, housing and connectedness have a big impact on health. There is no point telling an unemployed homeless person: 'Don't smoke, it's bad for you.' It's time the Government made a concerted effort to address the health needs of marginalised groups.